Be part of something great which is happening across the UK this summer, the NHS Big Tea Party! Hospitals and Healthcare services, businesses and community groups in Wales, Scotland, Northern Ireland and England will be organising tea parties from Monday 24th June to Sunday 7th July. The NHS Big Tea Party will take place around the anniversary of when the NHS and NHS charities were established. It provides us all with a fun opportunity to give back and show appreciation to NHS staff, and most importantly the money raised through the parties will make healthcare services even better for patients and in the future. Your NHS Big Tea Party can raise money for any healthcare service, ward or department close to your heart here in North Wales. Your tea party may be little, but together they will make a big difference for patients! The NHS Big Tea Party will be officially launched in mid-April, but you can register to take part now using the form below. Hello! 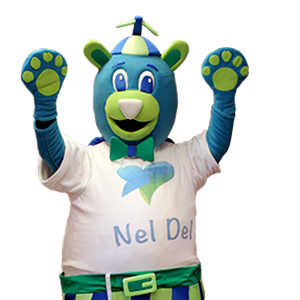 I'm Nel Del. I could come along to your NHS Big Tea Party! Contact the Awyr Las Support Team to request that I come and celebrate with you. Donate in memory of someone? Please include your relation to this person (e.g. Father / Mother / Friend).